Although oil drilling and fracking provide some of the energy that we all use, the practices are highly controversial for the toll they take on our environment. It gets especially knottier when we talk about our precious, hard-won public lands. Nowhere is this situation being played out more visibly than in Theodore Roosevelt National Park, which sits in the heart of the oil-rich Bakken formation. It’s clear that the Bakken oil boom in North Dakota has brought much-needed jobs and economic development to the region. But the fast pace of the drilling has also caused many problems, including industrial-scale impacts on the park and the land surrounding it. Watch A Boom With No Boundaries, shown below. Produced by the Center for American Progress, the video notes that currently much of the oil and gas drilling in western North Dakota is happening on private land. But in the coming years, development will accelerate at a breakneck speed on public lands right outside the park’s borders. A moderate estimate is that there will be between 40,000 and 60,000 fracking wells and oil rigs in the West River country of the state in the next 20 to 30 years. 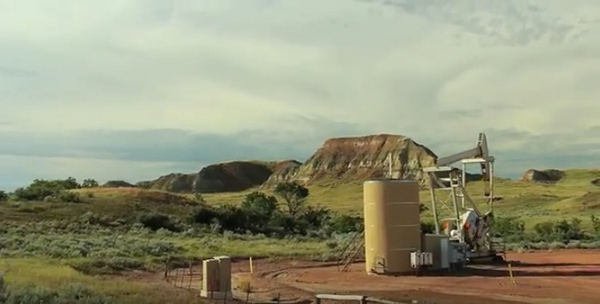 As is stated in the video, what that means is that virtually every place where there is oil shale to be exploited will be exploited. There is a fear drilling could even happen inside the park itself. Drilling already occurs within 12 national park units across the country. And Theodore Roosevelt National Park is one of 30 more national parks that the government has identified as places that could be drilled. To save, I would add, even if we haven’t seen them. The question is how much exploitation of natural lands can this earth take. The planet is at a tipping point. 50/50 EO Wilson’s Half Earth. Hello; This is a criminal act being blatantly conducted by the corporate machine and government; directly contradictory to U.S. Law. The corporate machine oil and gas division already hold U.S. Permits for leasing of approximately 66% of all unoccupied lands in this Country. Understanding the greatest risk / impact of hydraulic fracking, groundwater contamination, the questions are, “At what distance from wells do leaks / contamination occur?” and “How likely are leaks and contamination to occur?” I cannot definitively say what the average distance from a well leaks and contamination occur since I have never read an exact number. However, I can say that in a report by Jessica Ernst, M.Sc., President, Ernst Environmental Services, Ernst cites from a Quebec Ministry of the Environment 2012 inspection report that leaks were detected 43m and 500m from the Haldimand 1 Petrolia oil well (the source oil well). Stephen Osborn, Colleague of Professor Jackson and participant in the Nicholas School at Duke University’s 2011 fracking study states, “We found measurable amounts of methane in 85 percent of the samples [taken from an area where 68 wells were analyzed], but levels were 17 times higher on average in wells located within a kilometer of active hydrofracking sites”. Reports discussing the likelihood of leaks and contamination reflect variable results which seem to be based on the choice of materials, geological factors, and leaks being discovered then actually reported. The highest leak percentage I have read about was observed near Quebec where 50 percent of the 31 wells analyzed were leaking . In conclusion, I am not going to explain why we (the people of the United States) need to prevent fracking in or around OUR national parks but instead will let you digest what you have just read and make your own conclusion. Nor will I cite realized damages on the habitat, both plant and animal, which has already occurred in fracking areas near Yellowstone and the Susquahana River Basin. If what you have just read does stimulate you to want to know more about fracking or if it you still think the benefit outweighs the risk, you probably work for a fracking company. Don’t get me wrong, I consume energy and understand the want. I also believe the private sector of the United States is capable of producing a solution which eliminates the environmental impact of fracking. It’s necessary to expand the breadth of this discussion to include content detailing the process of hydraulic fracking and the associated risk/impacts that infringe within the actual park boundaries. Although, the audible and esthetic impacts are significant to park goers, it is truly the irreversible environmental impacts that warrant more attention. It’s necessary to preface with background information so readers understand the current scope of fracking since 2005 when congress voted to approve the Energy Policy of 2005. This policy contained a provision that has come to be known as the “Halliburton Loophole,” an exemption for gas drilling and extraction from requirements in the underground injection control (UIC) program of the Safe Drinking Water Act (SDWA). Other exemptions are also present in the Clean Air Act and Clean Water Act — The Clean Water Act focuses on improving the quality of the nation’s waters. It provides a comprehensive framework of standards, technical tools and financial assistance to address the many causes of pollution and poor water quality, including municipal and industrial wastewater discharges, polluted runoff from urban and rural areas, and habitat destruction . It’s important to understand (1) why the exemption was implemented and (2) the impacts of the exemption. 1)	The exemption enables companies to bypass performance standards so that extraction can be done with less scrutiny which makes gas extraction quicker and executed without disclosure of chemicals used during the process. The FracFocus chemical disclosure agency, managed by the Ground Water Protection Council and Interstate Oil and Gas Compact Commission, discloses commonly used fracking chemicals but does not however disclose additives citing, “there are dozens to hundreds of chemicals which could be used as additives”. 2)	Ground water contamination is the most common by-product of the exemption. Robert B. Jackson, Nicholas Professor of Global Environmental Change and Director of Duke’s Center on Global Change, was one of several Duke Professors to take part in a 2011 fracking study (one of the top five most-read papers on the Proceedings of the National Academy of Sciences website) to analyze the impacts fracking imposed on groundwater in Pennsylvania . Professor Jackson states, “At least some of the homeowners who claim that their wells were contaminated by shale-gas extraction appear to be right” . There are countless incidents reported by citizens detailing discolored water, “film layer” (thermo methane) on the top of water, and tap water that catches on fire when met with flame. Many of these citizens violate confidentiality agreements imposed by fracking companies when filing their reports. Marc Bern, attorney at Napoli Bern Ripka Sholnik in NY has negotiated about 30 settlement as of June 10, 2013 on behalf of homeowners who experienced cases of or similar in nature to the aforementioned. A specific case is that of Chris and Stephanie Hallowich of Pennsylvania. Visit http://goo.gl/0g88b to view the Bloomberg article detailing their case. The visual presence of a rig is no more offensive than the giant windmills that blight our countryside. I am also a little puzzled – the parks themselves were established to protect the wilderness and to provide sanctuaries for Americans. yet this video challenges drilling near park boundaries. If we want to exclude drilling from those areas, then park boundaries need to be expanded. Further, the current drilling technology dramatically reduces the number of rigs required to access oil and gas deposits. Instead of twenty wells being drilled with accompanying rigs, one rig can now do the same job of bringing energy out of the ground. It would be great to see factual evidence of “up to 40,000 rigs” being added to what is already being drilled in the Dakotas. It would be fine to have a sensible conversation about drilling for oil and gas, but it ought to begin from a factual perspective, not a fear-based agenda. State should preserve nature and oil exploration to be allowed in selected areas. Demand cheap oil products and you must be prepared to pay the price. How much do you value pristine National Parks?